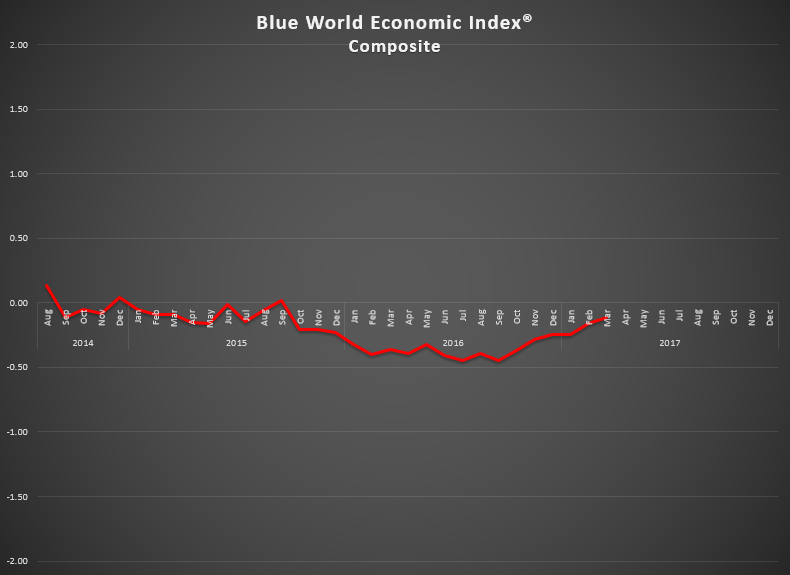 The economy continues its slow ascent toward the surface as there was material improvement for March 2017, although we are still under water according to the latest reading of the Blue World Economic Index®. The overall composite moved North by .05 taking us from -.16 to -.11. Of the eight major categories, advancers included General Measures, Consumer, Employment, Manufacturing and Real Estate, with Employment leading the way. Inflation readings remained flat while Retail and Services slipped. This is in line with the GDP, and Personal Income and Outlays reports which came in over the last two days. Consumer Measures and Real Estate remain the only two in positive territory, and quite comfortably at that, logging .22 and .23, respectively. Consumer Measures and Manufacturing, most notably the Fed Sub-Groups, continue to be the most fascinating as they are largely anecdotal and survey-driven data sets. Optimism is through the roof for firms and consumers, but it still has not carried over to the hard data. For example, Consumer mood measures, which are looked to as a predictor of retail spending, improved by another .03 and have been rising uninterruptedly since election day, but the Retail composite gave back .03, largely on a drop in autos, as inventories build at the retail and wholesale levels. The Manufacturing composite improved by .03, but that was on the strength of the Fed Sub-Groups (+.22) versus the hard data, non-fed reports which remained flat at -.18. What’s the wild card in all this? For all the optimism leading the way, most of the data was collected before the legislative healthcare fail. That hiccup, plus the continued questions about Russia and the recent announcement by Mike Flynn that he seeks immunity for testimony can’t help but throw some cold water on the institutional and consumer mood in April. We’ll keep an eye on all of it and report back here next month. 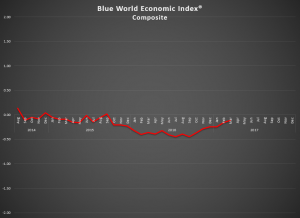 The Blue World Jobs Report Analysis for March will be out next Friday the 7th. See you then.